A small, but mighty tenderloin packed with nutritious flavor all around. Average weight on this tenderloin is 3/4 lb. 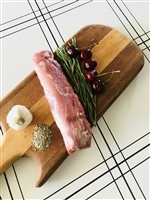 This pork loin roast is new favorite at our house. Pop it in the crock pot with some cider and apples, and take in the aroma of a perfect supper meal. Plus you'll have leftovers for another delicious meal! Grab one tonight for your family supper or group event. 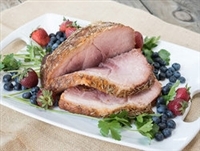 This fresh ham roast will blow your mind with it's exceptional flavor!! Slow cook this for pulled pork or fajitas: you really can't go wrong with this cut! Average lb per roast is 3 lbs. Need a roast to feed a crowd, and use for leftovers? This will fit the bill:: shred it for carnitas or use as pulled pork. 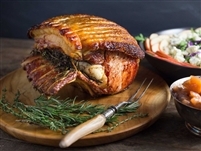 Either way this pork roast will not disappoint, with optimal flavor and limited extra fat. Average weight for this roast is 2.5 lbs. This is our amazing smoked ham in a smaller size. Just as delicious as the whole ham, with a bone in as well. These slices fit great in a crock pot, or roaster. Use as the centerpiece of the meal! 3-4 average slice. 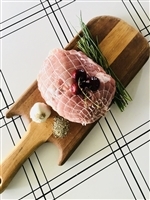 A delicious and mouth watering ham that is delicious anytime of the year, but especially during the holidays and chilly weather! Smoked to perfection for your table from our farm. Hams average 6-7 pounds.